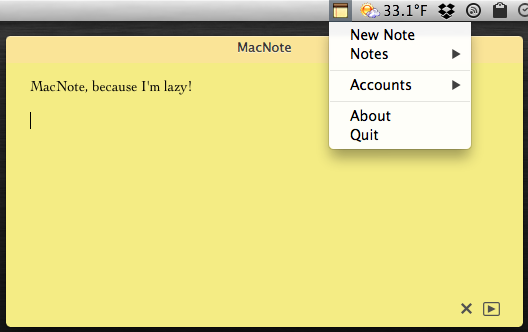 Are you looking for a simple and quick way to enter notes into the Apple’s Notes.app application from the statusbar? Don’t want the extra features of big note tools or really just like Apple’s built in Notes app? Me too! So I wrote a little utility to allow quick note entry to the Notes.app! Simply select your account, local or otherwise, and you’re all set. ~ by mohawke on January 18, 2013.